Cal Ripken Jr. holds many records in professional baseball, but it is his breaking of Lou Gehrig's (1903–1941) record of 2,131 consecutive games played that gained him so many admirers, who call him the "Iron Man" of baseball. The perseverance, endurance, and everyday work ethic that Ripken exhibited throughout his twenty-one seasons with the Baltimore Orioles made him one of the most popular professional athletes in all of sports. Calvin Edwin Ripken Jr. was born on August 24, 1960, in the small Maryland town of Havre de Grace, to Calvin Sr. and Viola Ripkin. His father had been with the Baltimore Orioles baseball team as a minor league catcher since 1957. After a shoulder injury dashed his hopes of a major league career, the elder Ripken stayed on with the club as a coach and manager at both the minor and major league level. During the summers, the family would leave Aberdeen, Maryland, about thirty miles north of Baltimore, and travel with Cal Sr. during the baseball season. Even with all of the traveling alongside his father, Cal Jr. never saw much of him because of the long hours he put in at the ball park. He soon came to the conclusion that the only way he would be able to see his father was if he played baseball. In 1976, Ripken's father was promoted to a coaching position with the Orioles in Baltimore. Cal Jr. was a constant presence, pitching and hitting during batting practices, retrieving balls, getting advice from major league stars like Brooks Robinson (1937–), and dreaming of becoming a Baltimore Oriole. In high school Ripken made the varsity (a school's main team which is usually made up of upperclassmen) baseball team as a freshman. Ripken played in the Mickey Mantle World Series in Texas in 1977 and won the Harford County batting title with an amazing .492 batting average (the percent of time a baseball player gets a hit) his senior year. His high school team was crowned state Class A champions in 1978 and, soon after, Ripken was selected by the Orioles in the second round of the annual baseball draft. His dream was complete, as he was now a member of the Baltimore Orioles organization. 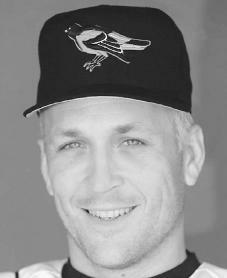 Ripken was employed by Baltimore's minor league team in Bluefield, West Virginia, where he was assigned the shortstop position instead of pitcher. His first season with Bluefield was not a great success. He had a .264 batting average and led the league in errors with thirty-three. Soon after, he was moved to the Orioles's Florida Instructional League team in Miami and improved to a .303 batting average. Rochester, with a batting average of .288 and twenty-three home runs, before being called up to the major leagues in August of 1981. Ripken had a batting average of only .128 in thirty-nine at-bats during his first season with the Orioles, but his second season would prove to be a turning point. Ripken's performance in his second season improved to a .264 batting average with twenty-eight home runs. He was selected as the American League's Rookie of the Year. In 1983, with Ripken firmly in place and comfortable, he helped the Orioles win the World Series against the Philadelphia Phillies. For his efforts he was voted the American League's Most Valuable Player for the series and the Sporting News player of the year. By the 1989 season, Ripken was slowly taking over as the team's leader. Despite losing the divisional title to the Toronto Blue Jays, Ripken committed only eight errors and hit twenty-one home runs. This made him the first shortstop to have eight 20homer seasons. On June 12, 1990, Ripken moved into second place for the record of most consecutive games played as he appeared in his one thousand three hundredth consecutive game, surpassing Everett Scott's mark. He also set a shortstop record by playing ninety-five games without committing an error. On September 6, 1995, Ripken became baseball's "Iron Man" as he surpassed Lou Gehrig's all-time consecutive games played record of 2,130. He had not missed a game since May 30, 1982, and when the game became official in the fifth inning, the capacity crowd at Baltimore's Camden Yards roared its approval. During a speech after the milestone game, Ripken underplayed his achievement and showed the humility (the state of not being arrogant) that had become his trademark. "Tonight I stand here, overwhelmed, as my name is linked with the great and courageous Lou Gehrig," he told the crowd. "I'm truly humbled to have our names spoken in the same breath." On September 20, 1998, Ripken took a day off work, leaving his streak of most consecutive games played at an astounding two 2,632, undoubtedly one of the safest records in all of sports. In July of 2001, Ripken played in his last All-Star game, winning the Most Valuable Player award. At the end of that season, Ripken walked away from the game for good. In retirement he holds nearly every Oriole offensive batting record, including most hits, doubles, home runs, and runs batted in. Campbell, Jim. Cal Ripken, Jr. Philadelphia: Chelsea House, 1997. Nicholson, Lois. Cal Ripken, Jr., Quiet Hero. 2nd ed. Centreville, MD: Tidewater Publishers, 1995. Ripken, Cal, Jr. Ripken: Cal on Cal. Edited by Mark Vancil. Arlington, TX: Summit Pub. Group, 1995. Ripken, Cal, and Mike Bryan. The Only Way I Know. New York: Viking, 1997. Rosenfeld, Harvey. Iron Man: The Cal Ripken, Jr. Story. New York: St. Martin's Mass Market Paperback, 1996. Savage, Jeff. Cal Ripken, Jr.: Star Shortstop. Hillside, NJ: Enslow, 1994.